If you have a Nespresso machine, but you’re tired of paying 65-85¢ for the Nespresso capsules, try out Gourmesso Capsules. It’s is a Nespresso capsule alternative for only 45¢ per capsule and we were able to do a Gourmesso capsules review. They sent us some capsules to try out for ourselves (who can turn down free coffee?) and we were very pleased. 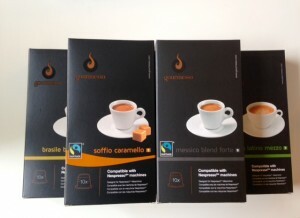 Comparing these to the Nespresso capsules, you would never know that the Gourmesso is nearly half the price! They’re compatible with all Original Line Nespresso machines. Gourmesso may be less expensive, but it doesn’t skimp on rich and tasty flavors. If you’re planning on stocking up on coffee and buying at least $50 worth, you’ll get free shipping! (4) Southern Savers readers are going to win 5 packs of Gourmesso capsules delivered straight from Gourmesso! Leave a comment below telling me which flavor you’d love to try. The winner of this giveaway will be chosen Wednesday, 4/22.